Pro Wrestle Fest announces Sting as their co-headliner the largest nWo reunion ever! Pro Wrestle Fest announced it's co-headliner for the largest nWo reunion ever. Former nWo member Sting is the co-headliner for the largest nWo reunion ever. Pro Wrestle made the announcement on Facebook. You can view the announcement here. 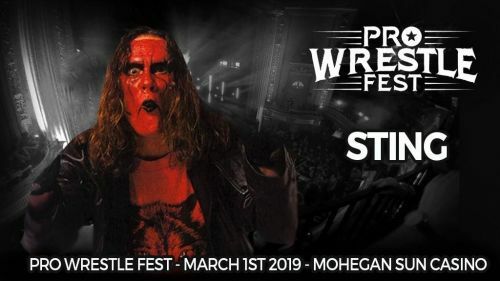 Pro Wrestle Fest also announced this is the first time Sting will be in the nWo WolfPac (red/black) face paint for the first time on the North East. Pro Wrestle Fest is taking place March 2nd at the Mohegan Sun in Conneticut. So far, they have announced the following nWo members. Tickets are currently on sale at prowrestlefest.com. You can purchase combo tickets that include autographs with everyone (minus headliner), exclusive prints, and more. Here is the combo list to date. Autograph/Combo/Pro Photo Op is as followed. The Black and White ticket will include the NWO professional photo op, autographs from everyone except the HEADLINER & Vendor Guests. Buff Bagwell Autograph will be included for free in every GA Ticket.